A Country Doctor’s Notebook is the book that was selected for me in the last Classics Club Spin. I was happy when I discovered that I would be reading this one, not only because it’s much shorter than most of the others on my Classics Club list, but also because I loved Bulgakov’s The Master and Margarita which I read four years ago in 2011. I knew this book was going to be very different from The Master and Margarita, but I hoped I would still enjoy it…and I did. A Country Doctor’s Notebook is a collection of semi-autobiographical short stories originally written in Russian in the 1920s (the edition I read uses Michael Glenny’s English translation from 1975). 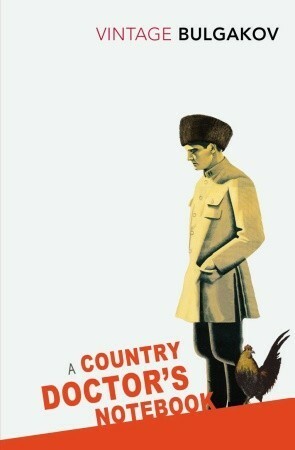 Like the protagonist of this book, Mikhail Bulgakov was a ‘country doctor’. After graduating from Kiev University he became a physician and from 1916-1918 he worked at a small hospital near a remote village in the province of Smolensk. The fictional doctor in the book, Vladimir Bomgard, is clearly based on Bulgakov himself and in the first story we see him as a young, newly-qualified doctor of twenty-four arriving at Muryovo Hospital, a full day’s drive from the nearest town. He is pleased to find that the hospital is clean and well equipped, but with no practical experience and nobody to turn to for advice (apart from a feldsher, or partly-qualified assistant, and two midwives) the thought of bearing sole responsibility for the lives of his patients terrifies him. During his first weeks and months at Muryovo, the country doctor faces all sorts of problems for which his university education had completely failed to prepare him. With no electricity, no telephones, poor roads, the risk of being cut off from the world during snowstorms, and the ignorance of peasants regarding simple medical matters, life at Muryovo is primitive and isolated. Most of all, the young doctor lives in fear of encountering a strangulated hernia, a case of peritonitis or a difficult birth and he comes to dread hearing a knock on the door in the middle of the night. As the book progresses the doctor slowly begins to gain confidence and discovers that true knowledge comes with experience. It was fascinating to read about conditions in a remote Russian hospital at the start of the twentieth century and the medical procedures and treatments that were used. I had a lot of sympathy for the doctor, being thrown in at the deep end with so little experience and being expected to operate on patients with no supervision and no advice other than illustrations in his textbooks. If you’re squeamish I should probably warn you that some of the operations he performs are described in full, gory detail (the tracheotomy particularly sticks in my mind). But this is also a book with a lot of humour and there are some very funny moments as the doctor panics, guesses and muddles his way through each crisis. As I mentioned above, I read the Michael Glenny translation which I was quite happy with and found perfectly readable. I enjoyed all of the stories in A Country Doctor’s Notebook and I’m so pleased the Classics Spin motivated me to pick up this book at last. This sounds so interesting – though I am a bit squeamish about medical details, especially gory ones. I’ve tried and failed several times to read Tolstory – maybe I will have better luck with Bulgakov. I’ve found Bulgakov much easier to read than Tolstoy, so I would recommend giving him a try. The medical details in this book are not very pleasant, but realistic, I suppose! I’d like this myself. Sounds very much a scene from early Sri Lanka! I hope you enjoy it if you do read it, Mystica. It’s a fascinating book! I am pleased to hear you enjoyed your choice from the spin. Sadly I haven’t got round to mine yet as I’m still reading The Pickwick Papers by Charles Dickens. Yes, I loved reading about the doctor’s first days at the hospital too. There were some very funny moments! The Master and Margarita is a great book but very different from this one.